SR Packaging has been committed to offering environmentally friendly packaging for many years. The Taiwanese company is active in researching and developing 'green' packaging materials, striving for an ever-reduced carbon footprint. 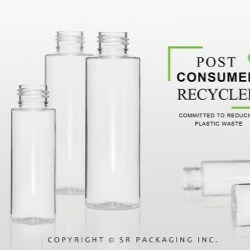 As part of SRP's commitment to the environment, the company offers PCR options for its plastic packaging products. 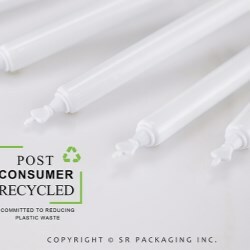 The use of Post Consumer Recycled plastic has a great significance for the environment, as the plastic has been recycled into a resin so that it can be re-used. The carbon emissions generated by the production process are reduced by approximately 60% so that the environmental and ecological impact is greatly reduced. At the cutting edge of both packaging technology and beauty packaging trends, SR Packaging can customize the amount of PCR material in its packaging according to brand requirements. SRP's extensive range of products —tubes, bottles and jars— can be produced with up to 100% PCR material, according to customer preference and styled with a number of decoration options. SRP helps the planet become a better place to live, making it easier for brands to protect the environment through the customization of its packaging products with PCR material. Explore product lines in SR Packaging's catalog.